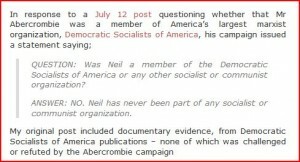 In 2010, I exposed then Hawaii Democratic Gubernatorial candidate Neil Abercrombie and his wife Nancie Caraway as sometime members of the US’ largest Marxist organization, Democratic Socialists of America. This relationship spanned more than 20 years, during much of which Abercrombie was a Democrat member of the U.S. House of Representatives. Now with Abercrombie in the Governor’s mansion and no election imminent, I thought it might be timely to re-visit the Abercrombie/Democratic Socialists of America connection. 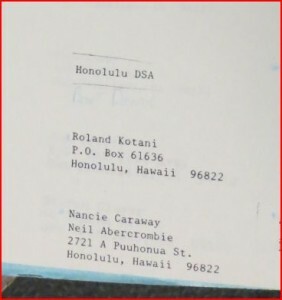 The above screenshot is from the Honolulu Democratic Socialists of America membership list from the early 1980s. Roland Kotani – A Democratic member of the Hawaii State House of Representatives who represented the Pearl City-Pacific Palisades area. He was killed by his estranged wife Grace Kotani on July 28, 1989. 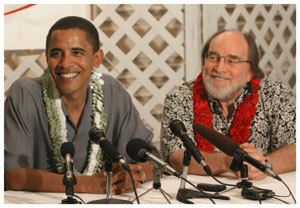 Nancie Caraway – Neil Abercrombie’s wife, a Barack Obama appointee as consultant to U.S. Ambassador Luis C. de Baca in the Office to Monitor and Combat Trafficking in Persons and a confirmed 1985 member of the Feminist Commission of the Democratic Socialists of America. Neil Abercrombie – Then of 2721 A Puuhonua Street, Honolulu, Hawaii. Please follow the blue links for more comprehensive KeyWiki profiles of Abercrombie and Caraway. Perhaps some honest Hawaii journalist would care to ask Governor Abercrombie why he chose to conceal his Democratic Socialists of America membership during the 2010 election cycle? Do the voters of Hawaii deserve to know that their Governor, a family friend of the United States President, was a Marxist and probably deliberately lied about it? This information has been brought to you by KeyWiki, a New Zealand hosted, online encyclopedia of the US left. If you want to get more of this information to the public please contribute today. Trevor Loudon is the author of “Barack Obama and the Enemies Within,” an oft referenced work that blew the lid off the President’s extensive Marxist background. He is also the Editor of this blog TrevorLoudon.com and of KeyWiki.org, an online encyclopedia exposing the covert side of US politics. ‘Neil Abercrombie and Linda Lingle” prison awaits you,prison awaits you….Yay.Can you sense it ……..Was the money worth it…..”Ka wahine ?ai honuas’ ” is calling to you for your crimes……”TREASON” oh yes “Treason”. It’s so very disapointing these people have betrayed us all and we have allowed it. NO MORE..
“Neil Abercrombies’ a disgrace to everything ALOHA,a shame.